O Trullo Abate está localizado no campo, em uma colina, de onde você pode admirar as antigas oliveiras, amendoeiras e a cidade de Cisternino. Na verdade, o trullo tem uma posição estratégica, a apenas 5 km de Cisternino, a 6 km de Ceglie Messapica, a 10 km de Martina Franca e a 7 km de Ostuni e depois a 18 do Mar Adriático. É uma estrutura particular de seu tipo, consistindo de um trullo cônico e 3 trulli sarracenos. É composto por um quarto de casal, uma cozinha totalmente equipada, uma casa de banho e outro quarto com lareira, onde há um sofá-cama confortável para 2 pessoas, no exterior existem 10.000 metros de verde disponíveis, com um gazebo. , onde você pode comer confortavelmente na sombra, um churrasco, redes e outras situações relaxantes e um chuveiro ao ar livre. Existe conexão com a internet. O trullo é equipado com lençóis, toalhas, secador de cabelo e uma cozinha equipada. É o lugar ideal para aqueles que amam o campo, a calma e querem relaxar e, ao mesmo tempo, fazer caminhadas nas aldeias características de Valle d'Itria. Animais de estimação são permitidos. Francesca and Brune, the owners, are very hospitable people and they speak good English. We had a very pleasant stay in Pugla. The area has many interesting places to visit, and all not far from the Trullo Abate. 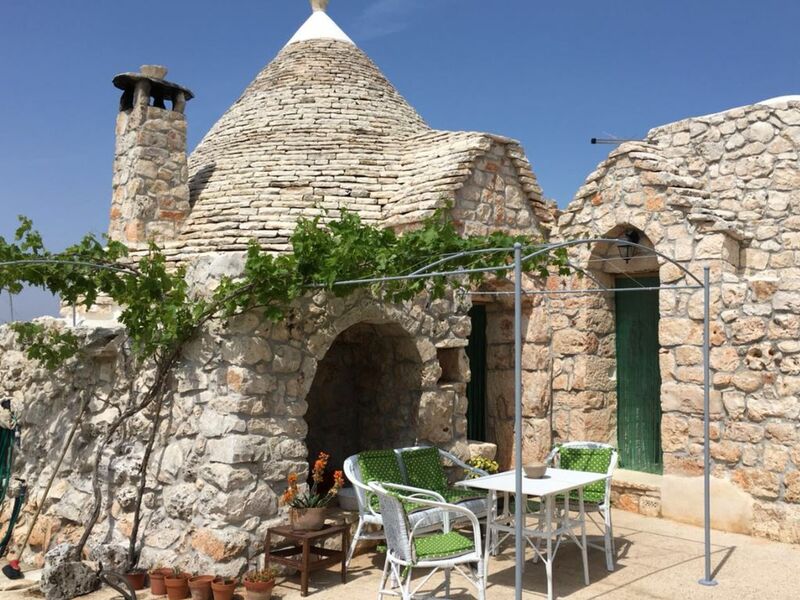 The trullo provides all the luxury you need during your stay. And it all works well. Outside the trullo there are a number of terasses you can sit and enjoy in the sun. Geweldig paradijsje op het platteland bij Ostuni. Prachtig gerestaureerde trullo op een fantastische plek met mooi uitzicht op Ostuni, 8 km verderop. Zeer compleet huisje met veel grond rondom. Wij waren er een week maar het is een heerlijke plek om voor langere tijd te zitten als je van rust en natuur houdt. Mooie dorpjes en steden op 7 tot 15 km in de omgeving. We wanted to stay somewhere away from it all, in a characterful place. We really couldn't have asked for more: this beautifully restored trullo is surrounded by olive groves with beautiful views over the surrounding countryside, and really feels tucked away. You can step outside from your bedroom in the morning and you are surrounded by peace and quiet and lovely greenery. It's reached by a small track from the main road going up the hill, and the nearest neighbours are a little distance down the track, you can just about see their roof poking out from neighbouring olive groves. Though it felt nicely isolated, it was ideally situated to visit all the lovely places in the Itria Valley - Ostuni, Cisternino, Ceglie Messapica, Locorotundo, Martina Franca, Alborello, coastal towns (on average 10 minutes to maximum 30 minutes away by car - you need one). It was easy to reach from Brindisi airport. Matera, at 1.5 hours, is also definitely worth a trip. The hosts were very friendly and lovely people - they gave recommendations on where to eat in the area and were very helpful. We love this place so much, we kind of want to keep it to ourselves and stay forever! We will definitely be back! If you think this place sounds amazing, you're wrong; it's better than that! The setting is idyllic and it's close to all of the best things in Puglia without the hassle of loud noises and fighting for parking. Before I came, I was a little concerned about security because I've never done a homeaway-type property outside of a city center plus the rental car company scared me pretty bad about not getting the extra insurance and having the car stolen, but between the heavy doors, alarm system, and front gate, I really had nothing to worry about. Not that the area seems dangerous at all, by the way. I spent several happy days hanging out at the property writing and relaxing without a care in the world as well as several more tooling around the region knowing that my precious things were secure. As for Francesca, she was extremely helpful and very welcoming. Although she lives in a town a little ways off, she introduced me to her friend who lives very close and who was available to help in a pinch (although I never needed him to come out). If you're considering staying here, you definitely should. I wish I could stay forever! Un angolo di paradiso: consigliatissimo! Il trullo abate è davvero il posto ideale per chi vuole godersi la pace della campagna della Valle d'Itria, senza però rinunciare a tutti i comfort, risultato di una riuscitissima ed attenta ristrutturazione di un trullo originale, in cui da ogni particolare si evince il buon gusto e l'amore per questa terra unica. Il trullo è "isolato" in mezzo al verde (altri trulli sono a debita distanza) ma molto comodo a tutti i posti splendidi della zona (Ostuni,Martina Franca,Ceglie,Locorotondo ed Alberobello, grotte di Castellana a 45 min, Ionio a 45 minuti, Adriatico più vicino, Lecce a 1 ora). Io e Michele e il nostro cane Noè siamo stati davvero benissimo, grazie anche alla disponibilità di Francesca e dell'amico Lello che fin da subito si sono attivati per venire incontro alle nostre richieste (orari check-in e check-out, consigli sulla zona, addirittura servizio di dog sitting!). Per concludere, la ciliegina sulla torta che rende una vacanza in questa fantastica zona davvero indimenticabile, è proprio il soggiorno nel trullo abate! Ci torneremo presto!! Grazie Francesca e Lello!